Anyway, I’m of the believe if it has my name by it then I better have given it my best effort. With the premier of the movie “Magic Mike” coming up our intrepid sartorial writer Christopher Muther thought it’d be a good idea to talk to local dancers after they attended the premiere of the movie in order to get their opinion on how accurate to reality is the movie. Their take was a mixed. Some thought it was an entertaining movie but not too close to reality. Others thought it wasn’t that great but it did show a lot of what exotic male dancers go through and have to put up with. Out of the four guys, two of them were kinda wildcards when it came to personalities. The other two were a bit more mellow. One because he was young and the other, the fourth on – in the black and white image – because he had been doing this for 17 years. He called himself the “grandpa” of the group at 42 years of age, and he said he mostly MCed the shows and managed the other dancers. I knew beforehand I was going to have a minimum of two dancers but that more could be coming as well. As you can see three showed up at first and then a fourth one came in late so we added him for another version of the same image. I enlisted the help of a couple of female writers and a former co-op, also a woman, to help us by throwing money at the subjects. 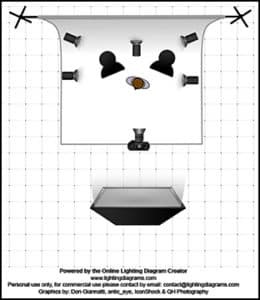 This is a bit of a complicated lighting set up. My idea was to make the scene resemble the kind of scenario in which they’d normally would find themselves performing. Kind of: night club with spotlights. There are a total of SIX lights being used in the color portrait of the three and then only FOUR in the black and white. Again, SIX lights for the individual portrait. Then there are two Dinalites with grids to the side even with the dancer in the front. One more Elinchrome 300 with a red gel coming from below and behind the dancers and pointed toward the black- paper backdrop. My idea was to sculpt their bodies with lights and I believe the effect was indeed achieved. At the end, the Dinalites couldn’t keep up with the Elinchrome and they started faltering. So the black and white image was done only with two Elinchromes on the side and slightly behind and then the other two Elinchromes: one behind me with the big soft box and the one against the backdrop on the floor. I am included a lighting diagram for the image of the three dancers.